32 bar jigs or reels. 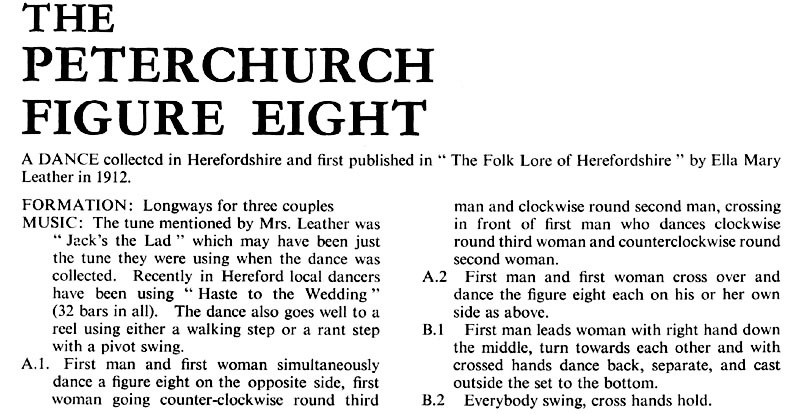 See Loxley Figure Eight and More Figure Eights From Herefordshire for more Figure Eight dances (from which the Turn Single Up is taken). Although the description says "cross hands hold" for the swing, I find it much more satifying to do a right forearm hold, with finger curled around your partner's elbow, and left hands joined underneath. This dance was also published in "Everyday Dances" by Nibs Matthews.